The School Construction Authority will build a permanent addition at P.S. 2 in Astoria, replacing this "modular building" erected 20 years ago, which was originally intended to be temporary. 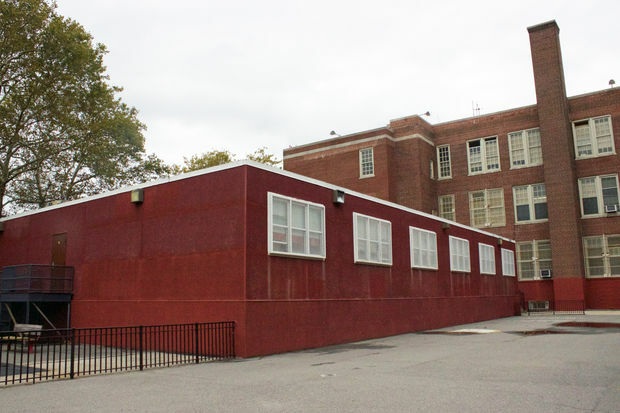 DITMARS — "Temporary" classrooms that have stood for the past two decades in the schoolyard next to P.S. 2 to accommodate overflow students will be replaced by a permanent addition, officials announced. Originally intended as a short-term fix for overcrowding, the "modular building" was used to house about 120 students from the school on 75th Street and 21st Avenue. The School Construction Authority will start designing the permanent addition soon, a process that will take about a year, at which point construction will begin and the temporary classrooms will be removed, officials said. The expansion is expected to take about two years to complete. When finished, it will allow all of the school's nearly 600 students to be housed under the same roof for the first time since the temporary structure was installed about 20 years ago. "Our students deserve a permanent educational space that’s indoors, rather than in modular buildings or trailers," City Councilman Costa Constantinides said in a statement announcing the plans. "The students at P.S. 2 will no longer be separated and will instead be able to learn in a unified environment." P.S. 2 is the latest local school to finally say goodbye to its longstanding "Transportable Classroom Units," or TCUs — trailers or prefabricated classrooms used to house students when there isn't enough space for them in a regular school buildings. During the 2011-2012 school year, more than 8,000 city students attended classes in trailer units, DNAinfo New York reported at the time. That number dropped to 6,767 students during the 2015-2016 school year, according to the DOE. P.S. 2 students who are currently taught in the temporary classrooms will be moved into the regular school building while construction of the new addition is underway, officials said.